Chris Jericho: “People ask, ‘What exactly is a perfect album?’ For me, the definition is that every song has to be an A- or better. If every song checks that box, it’s a perfect album. And Keeper Of The Seven Keys – Part II is that for me. I love Helloween so much that I took my name from their first album, Walls Of Jericho. They created the whole genre of music that’s now known as power metal. But when they first started there was no power metal. 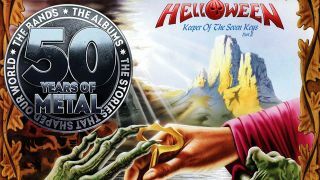 Metallica had the speed and Iron Maiden had the harmony guitars, but Helloween put it together – you had the massive double bass beat with these crazy, intricate harmonies. The new issue of Metal Hammer, celebrating 50 years of metal, is onsale now. As well as the full list of the 50 Greatest Metal Albums Ever as picked by metal's greatest names, it features brand new interviews with Tony Iommi, The Fever333, Gojira and more. And if that wasn't enough, it also comes with a free double-sided Iron Maiden poster and free Metallica beer mats. How cool is that? Order your copy here.